Douglas County Fire District No.2 and the City of Roseburg recently commissioned Emergency Services Consulting Inc. to prepare a study on the current location of fire service facilities and make recommendations for the placement of future facilities. Click here to view the final report. Douglas County Fire District No. 2 responded to a reported structure fire at 235 Joelson Rd. in Umpqua at 0754 hours this morning. 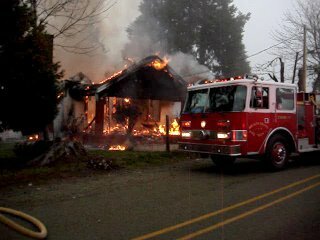 The house was reported to be fully involved in fire when the reporting party called 911. Three engines, two water tenders, and a Battalion Chief responded to the incident. The first arriving engine reported that the roof had collapsed as they arrived. The first two engines with 4 personnel quickly deployed hose lines and brought the fire under control. The structure is believed to be a total loss, however a nearby barn was not damaged. 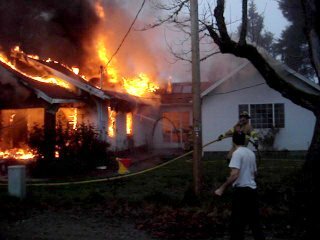 The total number of personnel on scene was 12 Fire District 2 firefighters and 3 from Sutherlin Fire Department. Click here for video. Douglas County Fire District No.2 Firefighters and EMS personel responded to a call at 117 Carmen for an elderly woman who drove into a wall which started a fire. An Engine Company, Ambulance and Battalion Chief were dispatched to respond to the incident. The first arriving unit determined that there were no injuries or fire and the Engine Company was canceled. The driver was attempting to open the gargage door when her foot slipped and she ran into the garage door. She then put the car into drive and drove through the garage wall damaging the electrical wiring and heat pump. The Douglas County Fire District No. 2 water rescue team and the Douglas County Sheriff’s Office Marine Patrol Unit responded to a stranded boater Friday afternoon. The boat was a 18.5 foot North River sled boat owned by Brett Agost of Milwaukee, Or. The boat was stuck sideways against a log and tree in the middle of the river. 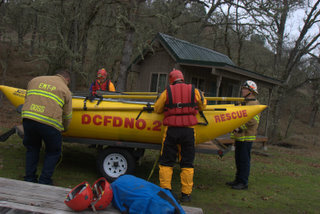 The incident took place on the North Umpqua River between the Winchester Dam and Whistlers Park. The powerful river currents refused to relinquish its grip on the boat as its two occupants awaited help from a friend who lived down river from the incident. First responders arrived to find the boat stuck approximately 100 feet from the shore with two occupants sitting in the boat. Rescuers made contact with the occupants who were refusing assistance. “They wanted to stay with their boat and wait for their friend to pull them to safety.” Rescuers staged personnel downstream with rope throw bags in case the boat capsized or someone fell in the river. The boater’s friend arrived and attempted to maneuver into position to free the stuck boat. All attempts to free the boat were unsuccessful and the Douglas County Sheriff’s Office Marine Patrol Deputy ordered the occupants to abandon the boat for the day. The boater’s were escorted to safety and all rescue personnel returned to station. A Wilbur family has something to be very thankful about this holiday season. Larry and Wonda Cotter woke to the sounds of a smoke alarm early Tuesday morning. Upon investigation they found their home to be filled with smoke and a small fire was burning in the kitchen. Larry extinguished the fire with the kitchen spray nozzle and removed the smoldering debris outside as the fire department responded. The Cotter’s were especially thankful as they had their grandchildren spending the night with them. Fire District No. 2 responded to the incident with three fire engines a water tender and two command vehicles. Fire personnel arrived eight minutes after receiving the alarm to find the home filled with light smoke. Firefighters were able to determine that the fire was out and had not spread beyond the interior finishes. There were no injuries as a result of the fire. The fire started in the area where Christmas lights wrapped in garland was located. The fire appeared to have spread from the lights to some light-weight curtains over a sliding glass door. The fire then spread to a table, chair, and flooring before being extinguished. Fire District No. 2 investigators will conduct a follow up investigation Tuesday. There was an estimated $10,000.00 damage to the home and contents. Battalion Chief Roger Johnson said, “This is another example of a working smoke alarm saving the lives of a family. The fire was spreading, and had plenty of fuel to burn” . Fire District No. 2 officials recommend that everyone test their smoke alarms this time of year. 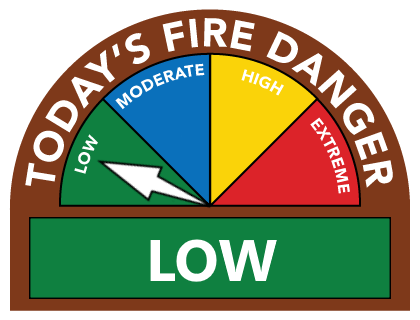 There are a lot of additional risks of fire this time of year. The use of candles and natural trees in the home adds increased risk. Cold weather also results in more structure fires due to heating appliances and space heaters placed too close to combustibles. In addition to the on board foam eduction system, the new engines have a high volume air compressor that injects air into the fire hoses. The air mixes with the water and foam and allows firefighters to adjust the thickness of the foam. The system is referred to as a “Compressed Air Foam System” or CAFS. Fire engines equipped with CAFS systems increase the amount of fire that can be extinguished with the same amount of water. Battalion Chief Johnson said, “The water carried on the fire engine should extinguish three times more fire when using CAFS than water alone”. Another advantage to CAFS is how much less the fire hose weighs. Fire hoses using CAFS weigh about half of what a hose filled with water weighs. This reduced weight allows firefighters to work with less fatigue. In addition to the fire engines, the fire district also purchased two water tenders which carry 3000 gallons of water each. The new tenders will be placed at the Dixonville and Melrose stations where there are limited fire hydrants available. The water tenders cost $273,630.00 each and should last 15-20 years. 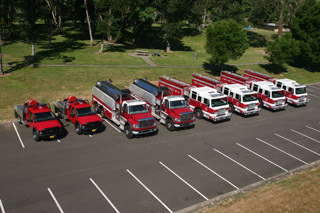 Lastly the district purchased two four wheel drive wildland firefighting trucks (brush rigs). The brush rigs are equipped with a water tank and pump and are designed to drive off road and extinguish grass and brush fires. The trucks are Ford F-450 Diesel trucks with a flatbed and utility boxes. The Water tank is a 250 gallon water tank with foam capability. The brush rigs cost $61,899.00 each and should last 12-15 years.